As well as being my last current HG kit, this was the final kit I purchased last year on new years eve in Tokyo as I had a bit of extra suitcase space. 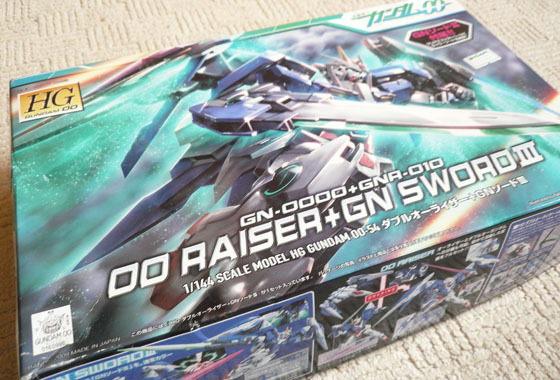 I should probably mention i’m not the greatest fan of the 00 Raisers design, the wings are cool but the docking of the 0 Raiser’s body feels a bit tacked on to me and makes the whole unit a bit back heavy. I’m hoping this kit might change my mind! Right let’s have a nosey at the kit itself! Lots of runners! and a stand included too, nice! 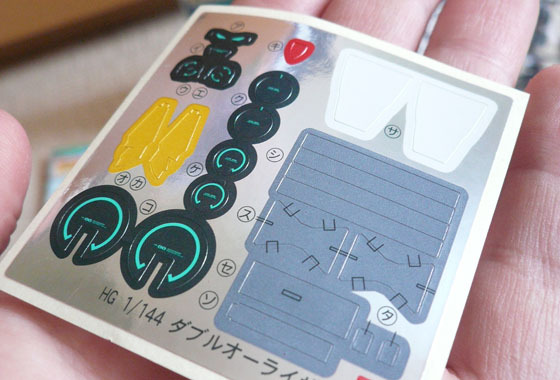 I’ve heard this kit was designed with posability in mind and some of these joint designs certainly look interesting to say the least. 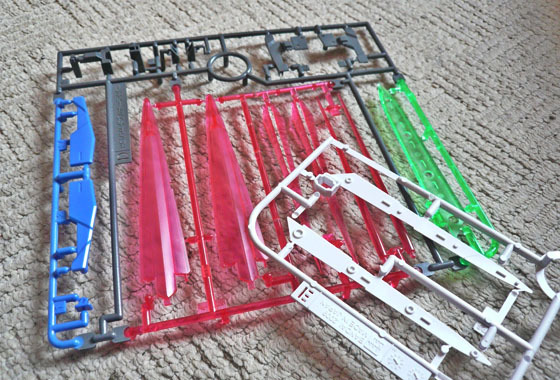 Just a few of the many blades that come with this one, i’m a little disappointed there’s only one beam saber blade though. Lots of foil stickers included. I’ll certainly use the eyes and the GN condenser decals. The others i’m going to try and dump and use paint instead. Looks like alot of parts on this kit have been merged together to improve stability and/or reduce production costs. Finally, the GN drives are a little disappointing. They have these huge gaping holes in them which would really have some kind of vent or vernier in them, I’ll have to have a rummage and see what I can find to glue in there! 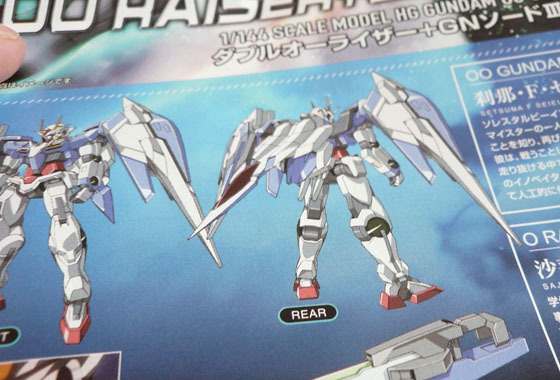 Are you a fan of the 00 Raiser design? Hi there – I stumbled upon this page via Figure.fm. 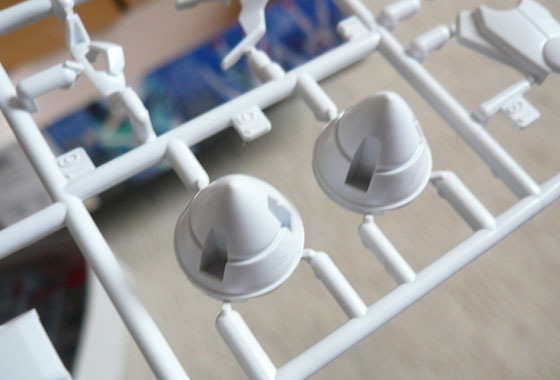 I’m not sure how you build your gunpla – build and paint as you go, or snapbuild first before deciding what kind of mods to use – but I thought I’d give you a heads up about the ‘gaping holes’ on the GN Drives. O Raiser’s wings connect to one of the gaps in the GN Drive [[the ‘lowest’ one; I’m not too sure how to explain it]], so I’d suggest leaving the filling of the gaps on the GN Drive as one of the later steps to take. I hope you enjoy the kit! Looking forward to its completion. Ah thanks for the heads up, that makes sense – I was wondering why they had less detail than the drives from the original 00 release. those exia legs are a work of art, though the rest of the raiser leaves me a little cold. i prefer some of the quirkier 00 seed designs, like the tieren. be good to see a wip for this james. 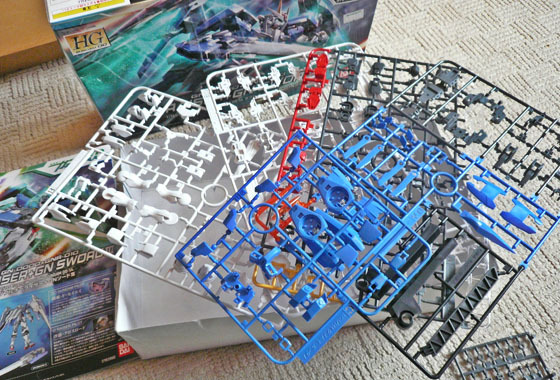 i think since your doing this and have already done a red frame i may tackle the zaku next.i’ll post a finished wip of the exia(its been done a few weeks!) and start in on the wip for a zaku. Heh, a UK BAKUC division, wouldn’t that be something 🙂 don’t think i’ll ever get to thaty level so I look forward to living the dream through your kits! one beam saber blade?there are 2 gn beam saber blades isn’t?